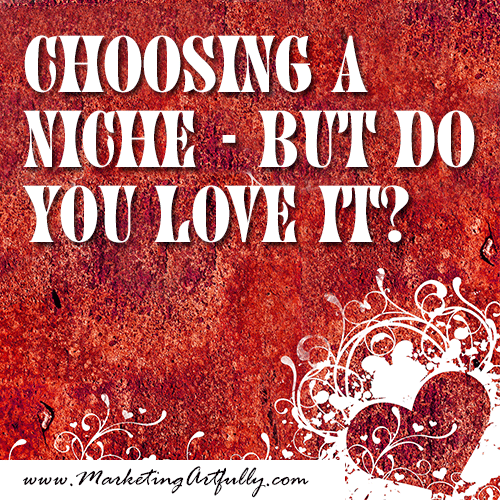 Choosing A Niche - But Do You LOVE It? You are here: Home / entrepreneur marketing / Choosing A Niche – But Do You LOVE It? Choosing A Niche – But Do You LOVE It? When you are doing entrepreneur marketing, there is nothing more important than to know who your perfect client is and then focus exclusively on that person when developing products or services. One of the ways that we recommend figuring out what you’re selling is to figure out what you like to do best. This has happened to me a number of times over the years. I started doing real estate in 2007 because I thought it would be fun and I would be good at it. Well I was! I was a GREAT real estate marketer, but a horrible real estate agent. Within two years I had a pretty huge practice and was MISERABLE because in reality because I like marketing not helping people buy and sell homes. I was in and out within a couple of years with a firm understanding that I like marketing. I have also fallen into other areas that I COULD do. Mostly they are one offs that are not profitable and take up way to much time once I get digging into what is needed. Check out this post to learn more about how these “detours” cost you time AND money…One-offs – How they cost small business owners time and opportunity! So how DO you go about choosing a niche? I KNOW, there are myriad people out there talking about how you should find your passion and then monetize that. That is cute, but there has to be a point where you really look at what the numbers are. If you love knitting and are a great knitter but not good on the computer, you are going to have a hard road to open up a local retail store and then finding enough other knitting others locally who will support your store. There are just too many online retailers that can crush you on price or selection. That said, you also DO NOT want to pick a “popular” niche just because it is profitable. I was cruising the interwebs the other day and came upon this article about wrestling and how the promoters were greedy. Pretty interesting in a marketing way. 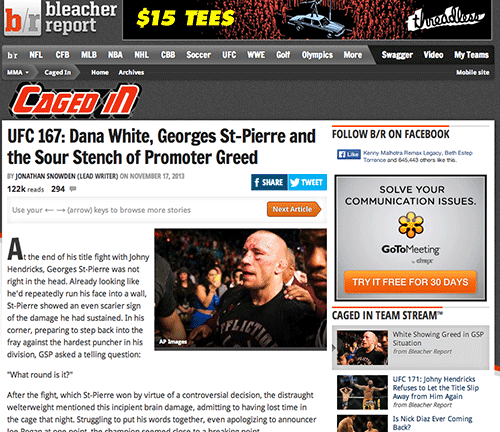 I noticed that the site was using other people’s footage and basically just reporting with some of their own commentary thrown in. There were also many marketing pieces there including ads and links that the website owner could make money from….interesting. Now, if you were trying to choose a niche, this one looks great! But for me, I would be able to write about one article that take me FOREVER to research. I would also have to start subscribing to and following blogs and news that was about sports, sport figures and the like. Don’t get me wrong, I like a good football game as well as the next gal, but that is definitely not a passion of mine. Won’t choosing a niche limit how much you can make? The next question I get about choosing a niche is, “but won’t I lose money by having such a narrow focus?” Um, just because you focus on and target a niche, doesn’t mean you won’t get opportunities outside that. You don’t turn them down, you just don’t focus on them with your marketing money or energy! Again with the entrepreneur thing, but I think it bears repeating…entrepreneurs are smart and capable, they are able to be nimble and pivot easily. That is a blessing and curse. With marketing, time and patience are your friend and if you are always flitting from one new project to the next, you will have a hard time gaining traction to do what you want and live your fabulous life! Pick a thin slice, focus on it for a good three to six months and then figure out if it is going to work. We tend to get WAY out ahead of ourselves with our ideas and fall in love or hate with something too quickly. Take a little time to plan your biz out and it will reward you in the long run! So how did this British upstart win my heart? Two – they have a great email list that sends the latest products AND pictures of finished projects AND news about where the owner will be…I AM stalking her after all! Four – she sells products in the US at stores like Michaels and Hobby Lobby. Five – she designs products that are good for her, things she is interested in using and because she is scrapbooker she is great at knowing what people like me want. Now, if you are choosing a niche or getting ready to launch a new company, this sounds insanely out of reach. There are A LOT of moving pieces to her success and it is hard to figure out how you could get all that in a couple of months. Well you CAN’T! If you are truly working on your passion and know what you want to do for YEARS you just need to start somewhere today. Pick your niche, pick your products or services and start today with ONE THING. Could be to sign up for an association site, setting up a website, sourcing products or basically anything that moves you forward one step. Tomorrow get up and do something else that moves you forward another step. Rinse and repeat. Picking a great niche (for you) WILL make things easier but at the end of the day, you just need to take the time to build an empire around doing what you love and keep that momentum going every day! Previous Post: « Using SEO and Tagging To Play The Game!